How Much Longer Will Rising US Dollar Crush Commodities And Mining Equities? -For over four years, capital has been flowing from Europe into the US Currency and Economy to get better returns. -The rising dollar and S&P 500 crushed commodities and emerging economies over the past several years. -Geopolitical uncertainty throughout the world is rising especially in the Middle East where now Russia and the West are taking on ISIS. -Rapidly rising US dollar caused horrible bear market in mining equities. -High US dollar is slowing down economic growth domestically which could be exacerbated by higher rates. Meanwhile, Europe and emerging economies may be bottoming and improving with the negative rates. 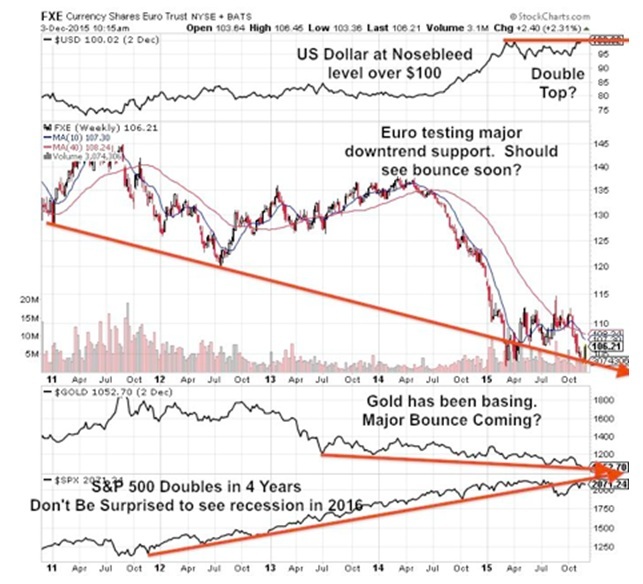 In May of 2011 I sent out this chart and published an article entitled, "The Euro-Dollar Dance Doesn't Fool Gold And Silver Bulls". I predicted that the Euro (NYSEARCA:FXE) made a bearish technical reversal, while the US dollar (NYSEARCA:UUP) was oversold and could bounce higher to resistance. The chart clearly shows the historical inverse relationship between the Euro and the Greenback which I called the "Euro Dollar Jig". When one moves up, the other moves down. At the time the Euro ETF was trading around $140 and the US dollar was hitting new lows, today 4 years later the currencies are in exact opposite positions. The Euro is hitting new lows at $105 while the US dollar is testing highs not seen since the 2008 deleveraging. I expressed concern back in 2011 that the US dollar could bounce to resistance. I never expected the greenback to get this strong and overbought testing 2008 highs with all of the trillions of dollars printed. I thought gold (NYSEARCA:GLD) and silver (NYSEARCA:SLV) would continue their uptrend with the dollar as a safe haven. Unfortunately, that did not occur. I predicted back in 2011 that Europe would follow the US by printing and that further bailouts of weak Euro nations would cause a decline in the Euro. As I expected back in 2011 capital flowed to the oversold US dollar. Commodities (NYSEARCA:DBC) and precious metals did not rally with the dollar as a safe haven and caused a major commodity de-leveraging putting pressure on major mining financial institutions such as US Global Investors, Sprott, Pinetree, Dundee and many others. In 2011, many funds began to raise cash and reduced their exposure to junior mining related equities (NYSEARCA:GDXJ). This has been going on now for more than four years, turning into one of the worst bear mining markets in history. This bear market is going on for years now as the US dollar bounces higher, while all other currencies including the Euro have been in freefall. This may soon change as the moves in the S&P 500, US Treasuries and Dollar are way overextended into nosebleed territory. Don't be fooled, the US dollar is overbought and ready to turn over while the Euro and precious metals could finally see the bounce they have been waiting for over 4 years. The exact opposite conditions of what we saw 4 years ago. The cheap Euro with negative interest rates is boosting exports from Europe where manufacturing is hitting new highs, while the US which is expected to raise interest rates is showing signs of a potential recession in 2016. US exports are slowing down. Europe's economy is speeding up and they are lowering rates, while the US is slowing down and they are going to raise the rates. This could cause the US dollar to turn over while the Euro and emerging economy currencies bounce higher as they grow while the US slows down. Back in 2011, I predicted the US' attempt to democratize the Middle East would be a failure. Now most of the Middle East is in turmoil and Islamic terrorism in Europe and the US is increasing - just look at the recent attacks in San Bernardino and Paris. The wars of the past decade in the Middle East have caused sovereign debt in Western nations to skyrocket and absolutely nothing has been accomplished. Debt limits are pushed higher. The credit ratings are poor in my opinion and should already have been downgraded by reputable agencies. 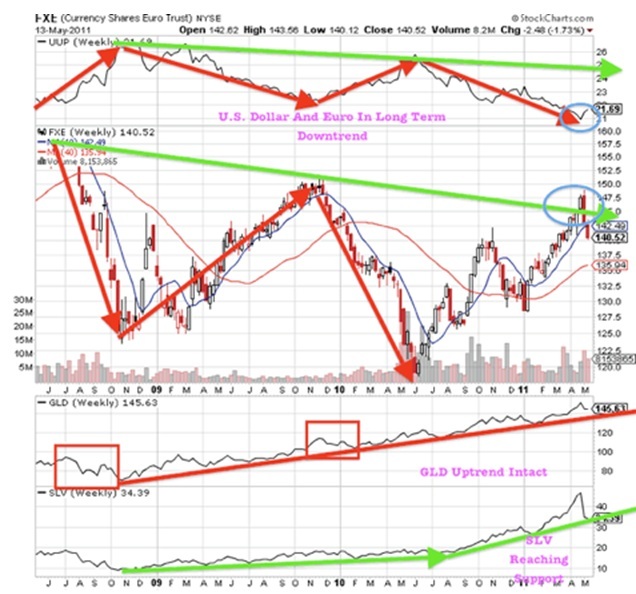 The investors who are short precious metals may soon need to cover as the Dollar reaches risky overbought territory and may soon make a double top. The S&P 500 (NYSEARCA:SPY) has doubled in the past four years and could see a major correction if we move back into recession. The best protection right now is to stick to undervalued assets in energy (NYSEARCA:XLE) and mining (NYSEARCA:GDX) and to avoid the momentum trap in the over-inflated S&P 500, US Dollar and Treasury Bonds (NYSEARCA:TLT). Remember we are in tax loss selling season which should hit the beaten down sectors the worst such as energy and junior mining stocks. At this time, buyers who have cash can get exceptional deals if they place stink bid as some sellers just write off some of their investments. Disclosure: I own none of the securities quoted.